What allows the AC 100-4L to maintain a strong lift charge when the outriggers are positioned asymmetrically is the IC-1 Plus control system. This was the scenario playing out for Union, Mo.-based CK Crane Service. Formed by Chris Keence during the challenging post 9-11 market conditions of 2001, CK Crane carved its niche in steel building erection, installing roof-mounted chillers, and serving the residential, commercial and industrial market segments. Over the years, CK Crane's customer base and market opportunities have grown, putting a strain on the company's small crane fleet. "Customers asked us to step up in crane size for years," said Keence, owner of CK Crane, "and we did so last year by adding a 65-U.S.-ton class rough terrain crane." It wasn't enough. Customer requests and the potential to expand its cell phone tower business started to make it clear the company needed a 120-U.S.-ton class crane. "That's a large step for a small company like ours," said Keence. However, CK Crane was passing up too much work, which made it necessary for the company to go big. Keence didn't take the decision lightly. He said he conducted in-depth research on which cranes would best suite CK Crane's current and future applications. "I was looking for a compact and reliable crane with the best load chart for our cell phone tower work," he said. However, many of the cranes he found in the 120-U.S.-ton class had five axles. When he investigated the Demag AC 100-4L, Keence found a crane that aligned with the company's lifting needs. "The AC 100-4L all terrain crane has four axles and is the most compact crane in the class," said Bryce Meier, regional business manager for Terex Cranes. "It has a width of only 8.4 ft. for most tire configurations and carrier length of less than 36 ft., which helps CK Crane to get into tight spots often encountered on cell phone tower installation projects." Beyond the crane's compact size, what intrigued Keence most was its asymmetric outrigger positioning. Other cranes have only three outrigger positions – fully extended, half extended and fully retracted – whereas the AC 100-4L offers five, allowing CK Crane to fit into tight positions. Keence said the crane can lift with jacked outriggers, with one side extended while the other is retracted. What allows the AC 100-4L to maintain a strong lift charge when the outriggers are positioned asymmetrically is the IC-1 Plus control system. This unique Demag control package determines lifting capacities for every position of the boom, subject to the slewing angle of the superstructure. As a result, the lifting capacity for a defined radius is no longer limited to the minimum 360-degree precalculated capacity. "IC-1 Plus enables the operator to use the maximum lifting capacity for the crane's configuration, especially when lifting over the outriggers," said Meier. The system's on-board computation capabilities enables CK Crane's operators to preview the lifting capacity for a predetermined set-up position. "The computer is designed to determine what the capacity is, which is a huge benefit for us over cranes we've used in the past," said Keence. The IC-1 Plus control system displays where lifting can be done and the available capacity for the crane's configuration. Keence's research concluded with CK Crane making the leap and purchasing the Demag AC 100-4L crane. For the cell phone tower applications, the critical crane feature for Keence is boom length, and the Demag crane delivers with a maximum system length reaching 268 ft. In CK Crane's eastern Missouri market area, cell phone towers come in a multitude of configurations and weights, with the heaviest, monopoles, weighing approximately 10,000 lb. However, many cell towers are constructed in 30- to 40-ft. sections with a diameter of no more than 4 ft., weighing between 3,000 and 4000 lbs. each. For this reason, Keence opted for the long-boom AC 100-4L model. "We offer two versions of this crane, the AC 100-4 with a 164-ft (50-m) boom and the ‘-4L' with a 195-ft (59.4-m) boom," said Meier. "This tailors the crane to the customer's need, and the long boom version is definitely the best fit for CK Crane's cell phone tower work." While cell towers vary from 80 to 300 ft. tall, Keence said most CK Crane encounters fall within the 150- to 250-ft. range. CK Crane also purchased an 88.6-ft. double folding swing-away jib plus a variable extension to give the crew the flexibility to efficiently construct the taller tower designs. "The jib gives us a stepless hydraulically adjustable offset from 0 to 40 degrees, so a load can be lifted and then tilted in the air to get in tight areas," said Keence. "It also has remote-control operation, which allows us to eliminate one person for jib set-up." When positioning the top pole sections, Keence said that the new cab on the AC 100-4L helps to keep the operator comfortable and productive. "Cabs have come a long way, and it's important to have a comfortable cab, since operators sit in there hours on end," said Keence. "The ability to tilt the cab plus the seat design makes it easier on the operator's back and neck." 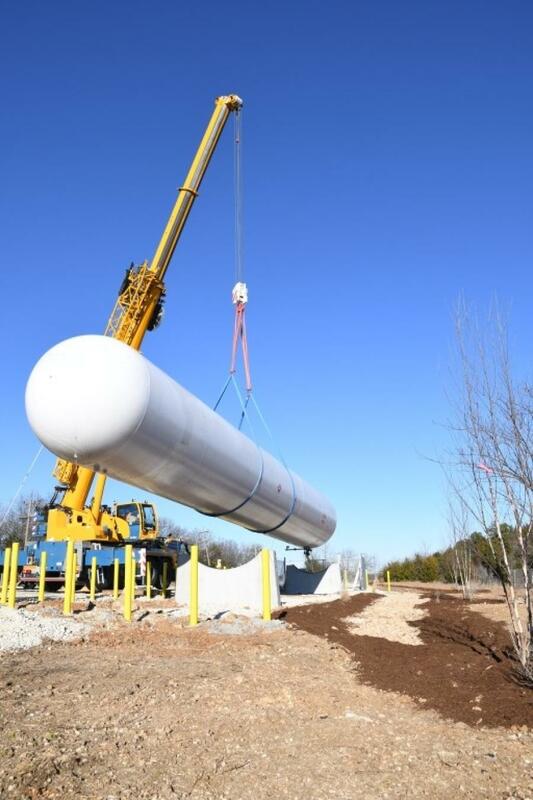 After taking delivery of the Demag AC 100-4L, CK Crane tested its capacity by immediately putting it to work lifting a 30,000-gal propane tank that a customer was moving to a new location. The crane and a trailer with 29,500 lbs. of counterweight were mobilized to the project site. "The counterweight is simple to install, and we were ready to lift in about 30 minutes," said Keence. The tank measured 65 ft. long with a 10-ft. diameter. To pick the tank from its pedestal and place it on the transport trailer, the operator used 70 ft. of boom and worked at a 20-ft. radius. "The total load weighed 54,500 lbs., and the AC 100-4L efficiently handled it," said Keence. Meier added, "Because the intuitive IC-1 Plus control package was designed to determine the load based on boom position, it allows a company to lift more with less counterweight, so they only have to mobilize the amount of counterweight necessary to make the lift." After long research, discussions with key influencers and the initial work completed with the AC 100-4L all terrain crane, Keence is confident he made the best crane choice for his company to make the leap up to the 120-U.S.ton (100-tonne) class. "It requires less room and less set-up plus it offers a long boom with a strong load chart," he said. "It's the right machine for our needs."